Supporting Transgender and Gender-Creative Youth brings together cutting-edge research, social action methods, and theory on the topic of transgender youth and gender creative kids. The chapters included specifically address issues in education, social work, medicine, and counseling as well as challenges and recommendations for families and parents. It is well researched and accessible to a broad audience of individuals invested in improving the social worlds of gender diverse children and youth. Elizabeth J. Meyer is Associate Dean and Associate Professor in the School of Education at the University of Colorado Boulder. 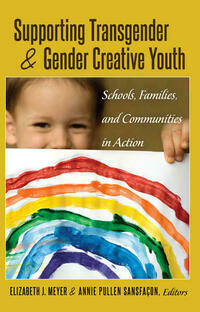 Meyer is the author of Gender, Bullying, and Harassment: Strategies to End Sexism and Homophobia in Schools (2009) and Gender and Sexual Diversity in Schools (2010). She completed her PhD at McGill University in Montreal, Quebec, Canada. Annie Pullen Sansfaçon is Professor at the University of Montreal’s School of Social Work. She has conducted many projects on the experiences of trans youth and families and is one of the co-founder of Gender Creative Kids Canada. Pullen Sansfaçon completed her PhD at DeMontfort University in the United Kingdom.